Over the past 8 weeks we have been seeing a steady increase in populations of the invasive brown marmorated stink bug (BMSB) in our pheromone baited Tedders traps placed along the woodland orchard edges. 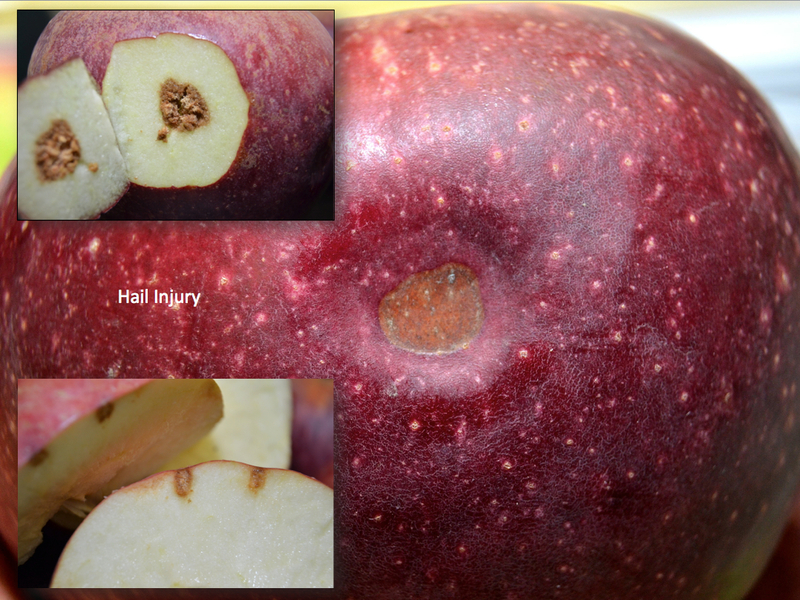 It’s no surprise that we also seeing an increase in feeding injury BMSB on red and yellow colored varieties, especially along the orchard perimeter. 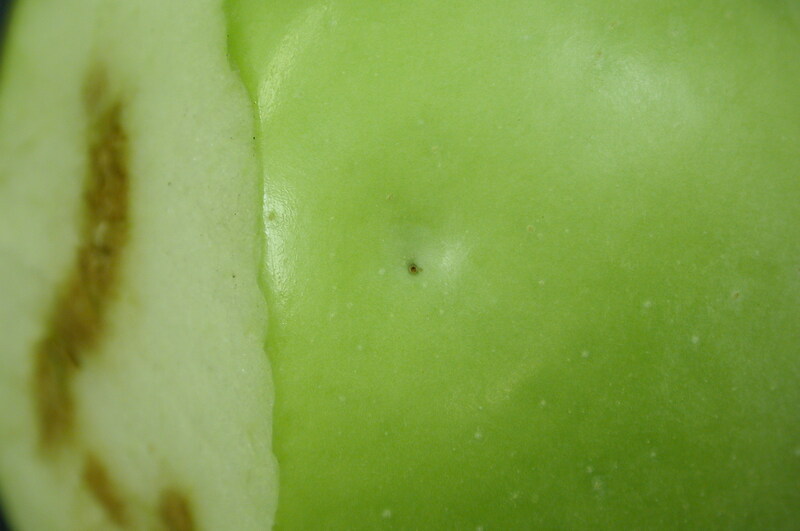 Its very important to note that stink bug injury does not express itself immediately on the fruit. Apple recently fed upon by the SB complex will likely be harvested and stored without blemish, only to find the same fruit with very high levels of fruit damage after its removal from cold storage. 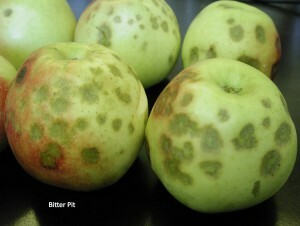 Efforts should be made to manage this insect complex prior to harvest. 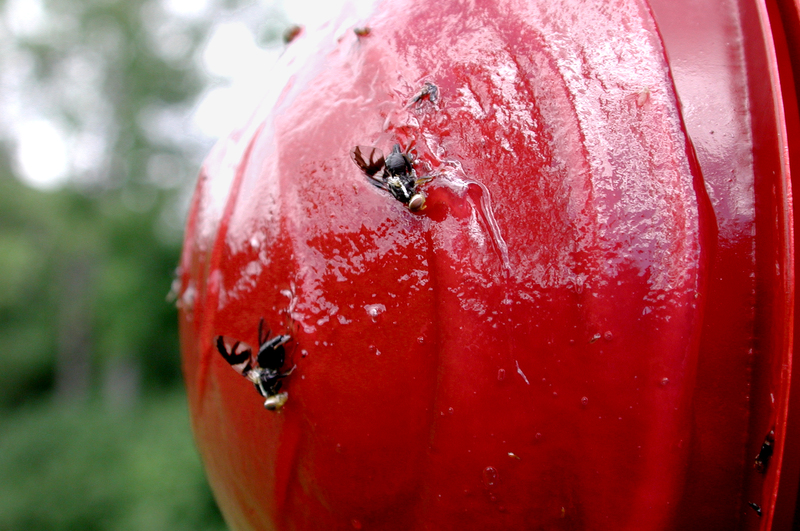 Management for this insect pest should continue until the last fruit is off the tree. Use of a 10 BMSB per baited BMSB Tedders trap threshold, followed by scouting along the orchard perimeter and use of a single adult stink bug as a threshold within 100′ of perimeter row, then followed by border row, alternate row and whole orchard applications if these thresholds are met should be strongly considered as movement of native and BMSB populations begin to migrate to and from orchards to feed, preparing for overwintering. Trapping efforts throughout the Hudson Valley have documented the presence of brown marmorated stink bug since late April. However, its presence in border trees or even in traps has not, up until late August, been a sign of BMSB presence in orchards causing feeding damage. The BMSB has recently begun movement into orchards to intensively feed, stocking up on reserves needed to successfully overwinter. In orchards throughout the Hudson Valley we’ve captured what we would consider the ‘Provisional Threshold’ numbers of adult BMSB in pheromone trap captures over the course of the past two weeks. First threshold occurred on the 23rd of July. Continued population growth have been observed above the 10 adult per trap threshold through October in a number of the orchards in which we trap. Always a ‘sting’ site in the center of the depression. Upon slicing, corking up to the skin surface. Never a ‘sting’ site in the center of the depression. Upon slicing, corking separated from the skin surface. Sometimes a depression. Most often only slight discoloration. Upon slicing, no corking BUT soft, oxidized fruit flesh, often with tunneling well into the fruit. Sting larger then SB feeding site, and always easy to see. Cutting directly beneath the sting will give rise to juice seeping up from the egg laying sting. 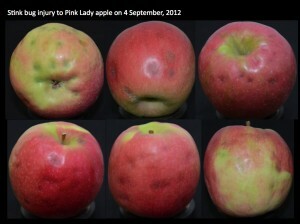 See images related to injury below. Trapping efforts throughout the Hudson Valley have documented the presence of brown marmorated stink bug since late April. However, its presence in border trees or even in traps has not, up until late August, been a sign of BMSB presence in orchards causing feeding damage. Ths BMSB has recently begun movement into orchards to intensively feed, stocking up on reserves needed to successfully overwinter. 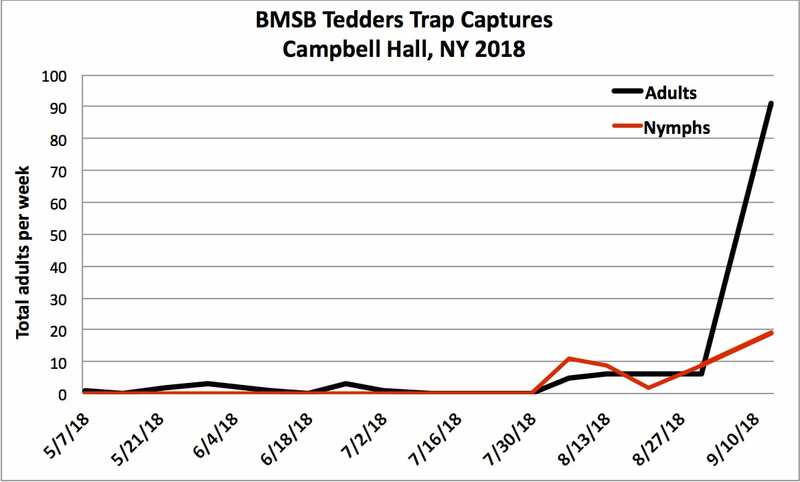 In orchards throughout the Hudson Valley we’ve captured what we would consider the ‘Provisional Threshold’ numbers of adult BMSB in pheromone trap captures over the course of the past two weeks. Populations above the 10 adult per trap threshold, sprayed prior to trap reset with an effective insecticide. Indications of stink bug presence can be observed in the presence of live SB in fruit clusters and harvested bins with examples of fruit injury of varieties remaining on the trees as is shown in the photos below. Control measures should be taken if this type of fruit injury is being observed. Very few insecticides are very effective against this insect complex with regards to residual efficacy. Those listed below are labeled for use against BMSB in NY and represent the best of university and USDA bioassay tested insecticides that will help to reduce the injury and increase mortality of the population. Consider using a non-ionic surfactant to increase penetration of the active ingredients. However, a tight schedule of no less than 7 days should be made if new fruit damage and stink bug adults continue. 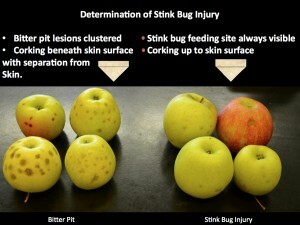 Multiple stink bug feeding punctures with discolored depression and corking to skin surface.